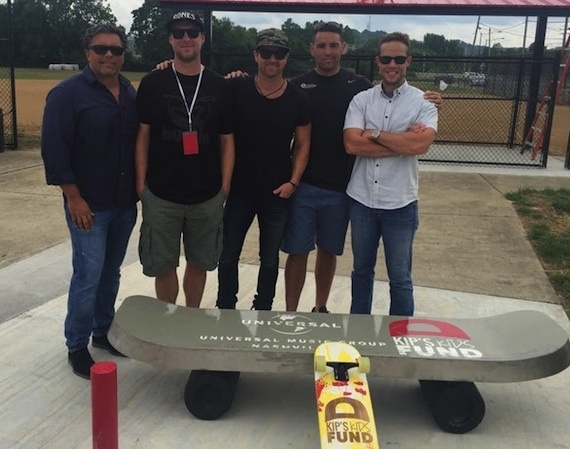 Kip Moore was on hand at the opening of a new skatepark in Cincinnati on Wednesday (July 27) as part of his Comeback Kid Skatepark Project. The Warsaw Federal Skatepark, a project of the Lower Price Hill Neighborhood Enhancement Program, features a 35-foot-by-68-foot pump track, three grind rails and a Hubba skate ledge. Kids in attendance were surprised with free skateboards, helmets, knee pads, and backpacks filled with T-shirts and socks. The Comeback Kid Skatepark Project is the first initiative of Kip’s Kids Fund, a donor-advised fund through The Community Foundation of Middle Tennessee focused on youth and teens. Other skatepark locations include Nashville; Boston; San Marcos, Texas; and Annapolis, Maryland.